One thing you are sure to find at any wedding reception is dancing. The Bride and Grooms traditional “First Dance,” is always a highlight. A great way to take the first dance to the next level is to sign up for dance lessons to perfect your moves. Farrah Valdez is the only ballroom dance instructor who specializes in wedding dance preparation in Salt Lake City. With over five years of teaching experience, a bachelor’s degree in ballroom dance, and over 25 years of dance experience, she is fully qualified to help anyone prepare. Her training includes: ballet, jazz, hip hop, modern, ballroom, Latin, salsa, swing, and more. The variety of her background allows her to create a unique dance for every couple she works with. Farrah started teaching dance at a studio in San Diego in 2011. It was there that she realized she loved teaching couples preparing for their wedding, and that there was a real market for wedding dance lessons. She started her own business and since then her mission has been to help people feel comfortable dancing at their wedding, have fun during their lessons, and create a custom dance unique to their goals. 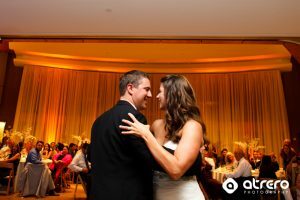 Why wedding dance lessons? The biggest reason is because it give couples confidence dancing in front of their friends and family, and given it is a formal occasion and the only time they will ever “perform,” why not take advantage?! The second reason is because it is a part of the wedding planning process that couples can do together, and a part of the wedding that is fun and not stressful. Lastly, because it makes the wedding unique! Guests will love to see what the bride and groom have put together, and the potential for creativity is endless. Every engaged couple has a different vision of how they want their dance to look on their wedding day. The majority of people just want to feel comfortable, and not “look stupid.” (That’s a direct quote, by the way, from 70% of her couples!) In those situations the couple wants to learn some basic steps, enough to not repeat the same step, and finish with a simple dip. The next group is looking for more then the basics, and they want to learn a larger variety of steps and some choreography. The last group wants to impress their audience with something original, perhaps an unexpected song choice, a fully choreographed dance, include members of the family or bridal party, or they want to do a medley of different songs and/or styles of dance. No matter what the goals, Farrah can help everyone! For more information about Farrah’s dance background, pricing, and faqs, you can visit her website at www.SaltLakeWeddingDance.com. She is also available for dance lessons outside of weddings, such as group choreography, group lessons, single lessons, and on-location lessons.